The founder of the Bipartisan Policy Center bemoans political gridlock in Washington, D.C., and suggests common-sense changes. Grumet started the center in 2007 after lining up two Republican senators and two Democratic senators as his big-name supporters. Two of those senators, Bob Dole and Tom Daschle, wrote forewords for the book. Grumet, the former director of the National Commission on Energy Policy, fervently believes that the massive divide between the two major political parties in the United States can be bridged, and he has been able to marshal effective reform in the areas of immigration law, health insurance and budgetary debates. The author notes that there never really was a golden age of party politics, but as late as the 1990s, philosophically divergent politicians tended to agree that they desired greatness for the country and so eventually compromised enough on the details of legislation. 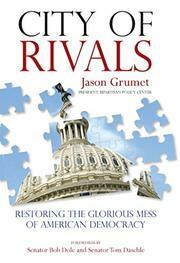 Much of the compromising occurred, Grumet writes, because members of Congress took time to become acquainted personally. Individuals who know each other well, even when acting as sincere policymaking enemies, will gather informally to discuss legislation compromises. Many of today’s policymakers have become so driven to constantly raise campaign money that socializing becomes expendable. As a result, members of Congress meeting in committees or debating in the chambers tend not to know each other well, making it simpler to demonize the opponent and dampening the spirit of compromise—sometimes permanently. Grumet suggests, for example, that members of Congress travel together on fact-finding missions, rather than just political junkets meant primarily to impress constituents back home. A superficial devotion to Congressional ethics has gone too far, Grumet writes, replacing useful fact-finding groups with stay-at-home members who do not reach across political party boundaries to piece together a coherent legislative agenda. An optimistic yet realistic call for reform in the interest of repairing what is broken in Washington.